First, the Griffon Refcard is available from DZone. 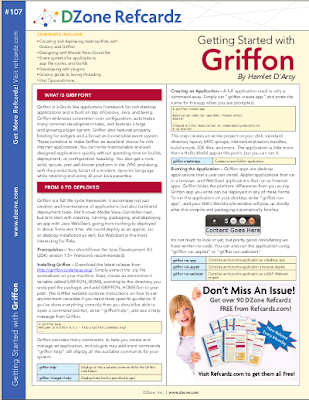 It is a concise 6-page reference to getting started and working with Griffon. If the only thing you know about Griffon is that it is a Grails and Groovy based framework for building desktop applications, then this RefCard will fill you in with tons more details. And if you’re an old Griffon hack, then you’ll probably still pick up some new tips and tricks. I wrote it, and always like to hear feedback. Plus, DZone published an interview with Canooie Andres Almiray, the Griffon project lead. You can read the interview here, or click the RefCard below to download the card. Anyone interested in Griffon in the Swiss area should come out to Hackergarten on the 30th of July. Several experienced Griffon developers will be present including Andres. And there is free pizza!